Vegan Traveler On A Journey: A Vegan Bakery In Bethlehem, PA ? A Vegan Bakery In Bethlehem, PA ? What a miracle! My sister "C" and I typed "vegan restaurants" into our GPS enabled cell phones and "Vegan Treats" popped up. We were visiting family in northeast NJ and took a drive one day to visit my Dad who lives in a very small town in PA. Our goal was to take him to lunch but we gladly accepted the 20 minute detour to Vegan Treats. It is in the middle of a town called Bethlehem near remnants of old steel mills and a quaint town. 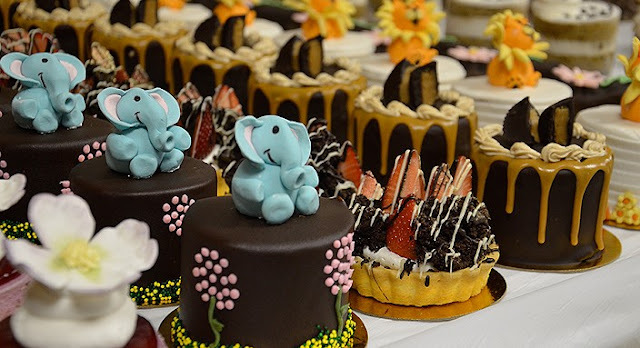 Finding this bakery where everything is edible was like a miracle! Only strange thing was that the girl at the counter told us she was not vegan. (HUH?) I bit my tongue and started drooling instead. Maybe she was related but I'd like to think there must be vegan in Bethlehem looking for a part time job. Anyway - a picture is worth a thousand words. In the summer bring a cooler with you.